Julien’s Auctions, the world’s premier entertainment and celebrity estate auction house will auction an extraordinary collection of personal property from the legendary entertainer Bette Midler on Saturday November 12, with some proceeds going to her charity. The auction will feature some of Ms. Midler’s most iconic and instantly recognizable looks, including her famous mermaid costume, stage costumes designed by Bob Mackie, designer dresses from Valentino, vintage Emilio Pucci, costumes featured on record covers and promotional materials, costumes from her films, outrageous headdresses, spectacular stage sets, sketches, gold records, art, jewelry, and items from her personal collection. Bette Midler Album Cover Dress (Est. $2000 – $3000). Featured on the back cover of the 1972 debut album The Divine Miss M, and subsequently on the front cover of the 1976 album Songs For The New Depression. Bette Midler Album Cover Dress By Bob De Mora (Est. $1000 – $1500). This dress was worn by Midler on the cover of the 1998 album Bathhouse Betty. Dress has since been utilized in a video shoot, photo shoots, and live performances. Bette Midler Performance Jumpsuit (Est. $500 – $700). Worn by Midler during performances of the 1979 – 1980 Bette! Divine Madness tour. Bette Midler Vegas Showgirl Costume (Est. $2000 – $3000). Worn by Midler during performances of the 2008 – 2010 show at The Colosseum at Caesars Palace Las Vegas, The Showgirl Must Go On. Bette Midler’s Delores De Lago Costume (Est. $1000 – $1500). Worn by Midler during performances of the 2008 – 2010 show at The Colosseum at Caesars Palace Las Vegas, The Showgirl Must Go On. Bette Midler Academy Award Gown By Valentino (Est. $1000 – $1500). 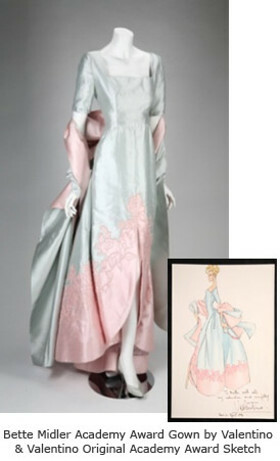 Designed by Valentino and worn by Midler to the 64th annual Academy Awards in 1992. Midler was nominated for Best Actress for her portrayal of Dixie Leonard in For The Boys. There is no doubt in the minds of her millions of fans worldwide that Midler reigns as the self-proclaimed “Queen of Trash,” which actually foreshadowed her second passion– one she says is the most important work of her life. She is the founder of New York Restoration Project (NYRP), a non-profit organization she created in 1995 when she and her family moved back to New York City and found many of its parks, community gardens and open spaces reduced by abandonment and neglect to a state of complete disrepair. A force of nature herself, she immediately mobilized friends and community leaders and began the now 16-year old greening organization that will benefit significantly from the auction sales. The Exhibition of The Collection of Bette Midler is free to the public in Beverly Hills and is open from 10 am – 5 pm on Monday – Saturday from October 31, 2011 – November 11, 2011. Find out more here.